Our Set of 3 Bowls is OUT OF STOCK, but we have ordered more! You are still able to purchase it now and we will ship it to you as soon as it arrives. Questions? Please call 1-800-438-5346 or email us at info@Lehmans.com. Similar bowls are often seen in antique stores, because that's how long they last. We found an Ohio company still making these durable kitchen bowls. They're the ideal size and weight for mixing, baking and serving almost anything. Two wide dark blue stripes give them a touch of decoration that complements any kitchen, from old-fashioned to modern. Small Shoulder Bowl- 3-1/2"H x 6-1/2"OD, holds about 3-1/2 cups, 2 lb. Medium Shoulder Bowl- 4-1/2"H x 8-1/2"OD, holds about 8 cups, 2-3/4 lb. Large Shoulder Bowl- 5-3/4"H x 11-1/4"OD, holds about 16 cups, 6-3/4 lb. Note: The "shoulder" on these bowls is the wide lip at the top. I passed my Grandmother's bread recipe down to my daughter when she married, and purchased the large shoulder bowl for mixing the bread dough. She is in love with this bowl. I was envious when it arrived and i saw the amazing quality and simple beauty of this bowl. I now purchase this bowl for every young woman coming into the family, and present it to them at their bridal showers along with the bread recipe, in addition to measuring utensils. It is always their most treasured gift, and I enjoy giving it as much as they enjoy getting it! I have two more weddings coming up this year, so I will most definately be purchasing a couple more! I am in love with these bowls. I use them every day for just about everything! 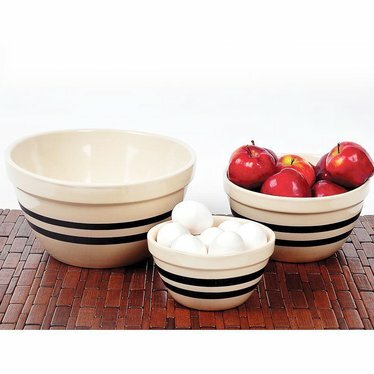 The large bowl is the perfect size for letting bread dough rise while I prepare veggies in the medium bowl and put out some fruit in the small bowl for the kids to snack on. They clean like a breeze and look beautiful in my kitchen!